Britain's GKN engineering group has sold its 50% stake in its helicopter joint venture AgustaWestland. Italian partner Finmeccanica has bought the stake for £1.064bn ($1.96bn). GKN said the "transforming" sale of the Yeovil-based aerospace group would allow it to cut debts and focus on strengthening its other businesses. It means the end of UK ownership in the helicopter industry, leaving an industry dominated by North American and continental European manufacturers. GKN has said it hopes to make new acquisitions to boost its car business and other aerospace ventures, with reports suggesting possible acquisitions in the US. 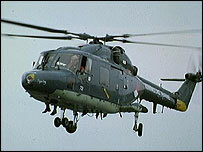 Westland and Agusta joined together in 2000, creating a company with an order book totalling £5.33bn.